Then i washed the whole sand with thinned catachan green mixed with Lich Purple. I painted the mesh with codex grey highlighting it with fortress grey and making little light spots on edges with Skull white and fortress grey. Then i washed it with thinned coats of Dark Flesh, then i made small rust dots with Dark flesh + Blazing orange. 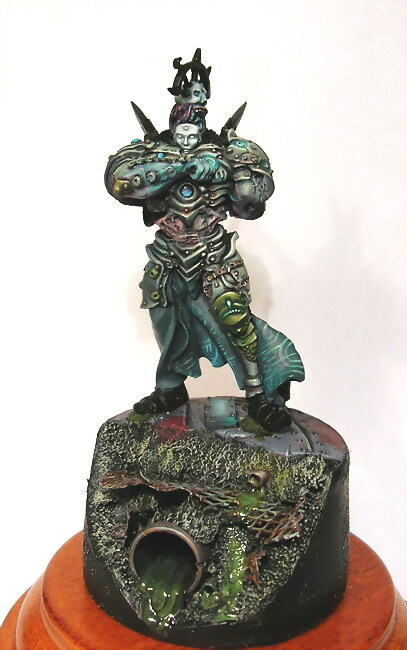 The big tube was painted with semi-NMM tecnique. Based it with dark flesh + scorched brown + codex grey then higlighted it with fortress grey till i reached pure Fortress grey, making a small highlight line on the edge with fortress grey + skull white. The small tubes were painted with the same style just with slight different coulors... (one with a scaly green base, the other one with a vomit brown base). 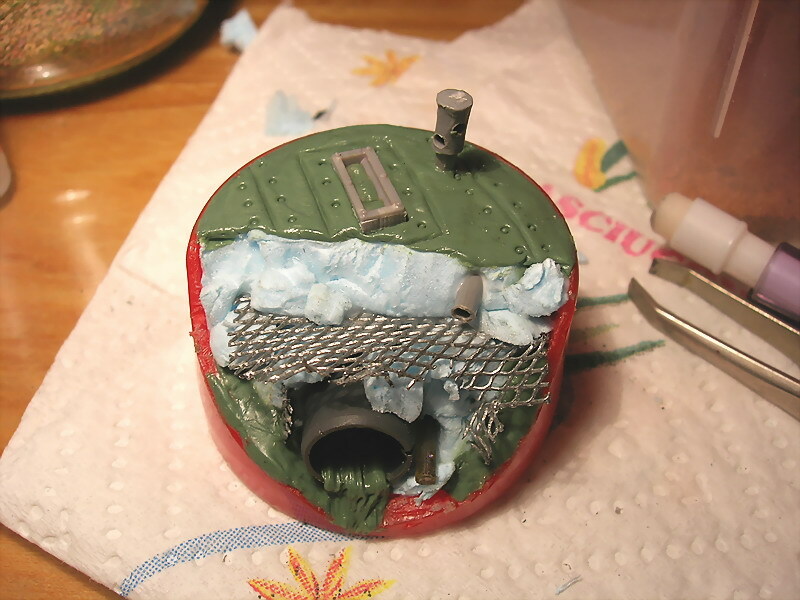 The slime coming out from the big tube was painted with scaly green mixed with catachan green, highlighting it with camo green then small dots of rotting flesh, then 2 thinned coats of Gloss Varnish. 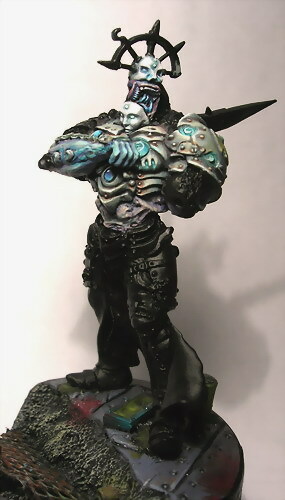 The other slime drool was made with lots of coats of GW water effect (free hommage if i had to buy it... nevermind! 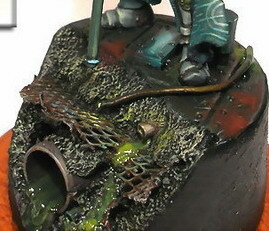 just use vinavil...) mixed with catachan green, then Water effect mixed with camo green. I drybrushed slightly the area around the slime with catachan then camo green to obtain a sort of "dried" slime oxidation. I painted the optical cable with chaos black + scorched brown then highlighted it with vomit brown, then i painted a small OSL at the end of the cable. The small chimney and the stained glass window were painted in the same way. 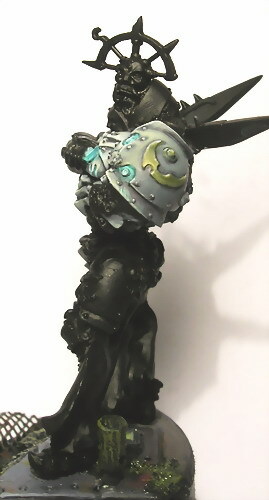 Chaos black + scaly green, highlighting it with hawk turquoise + fortress grey till pure fortress grey. 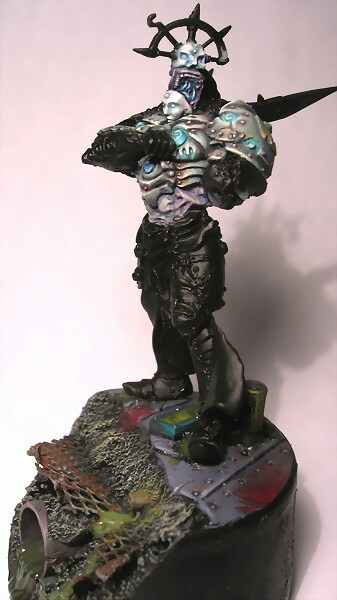 I filled the "window" with gw water effect mixed with skull white do give a dull glass effect. 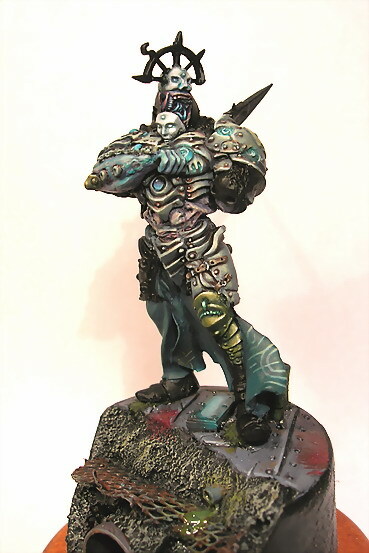 The metal plates were painted with a mix of scorched brown and scaly green, highlighting them with dark flesh and fortress grey, keeping in mind i want the global light source coming from our right (then centurus' left). Small blood stains were painted with scab red and highlighted with dark flesh. That's all for the base... we can pass to the mini! 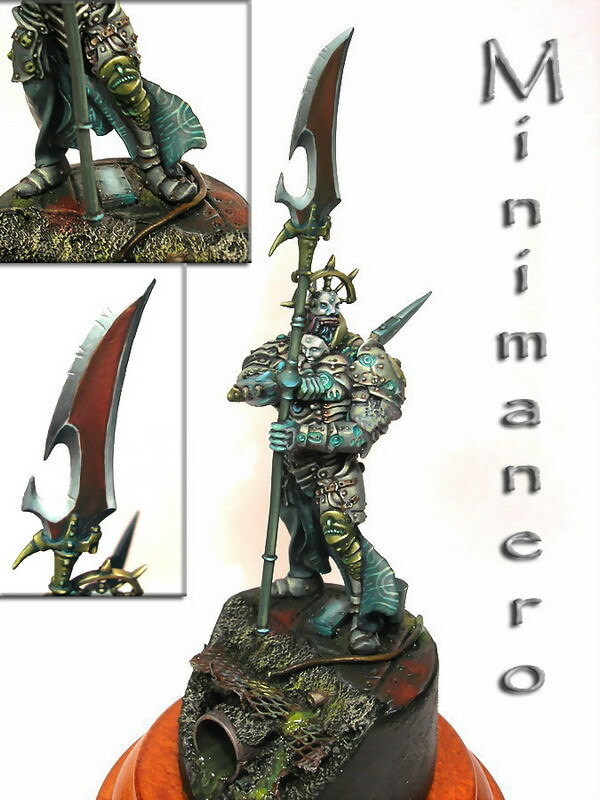 I realized it would be impossible to paint the mini with the halberd attached so i preferred to mount it later. First i carefully filed all the molding lines on the mini, then i glued on the back two Saurus spears tips, then sculpted a little bit of flesh like it was bio-molded to the rear blades, then i gave to the mini a spraycoat of Chaos Black. First of all i choosed to start with the armour, but i didn't want a simple gray armour... so i searched something more complex. -highlight with bleached bone, then skull white light points. -wash with thinned scaly green + hawk turquoise. The cape was painted with codex grey + scaly green + chaos black then highlighted with codex grey + rotting flesh + scaly green then i did small freehands on it addin more and more rotting flesh to the mix... Then finally i mounted the halberd! The inner part of the blade was painted with Scorched brown highlighted with dark flesh. 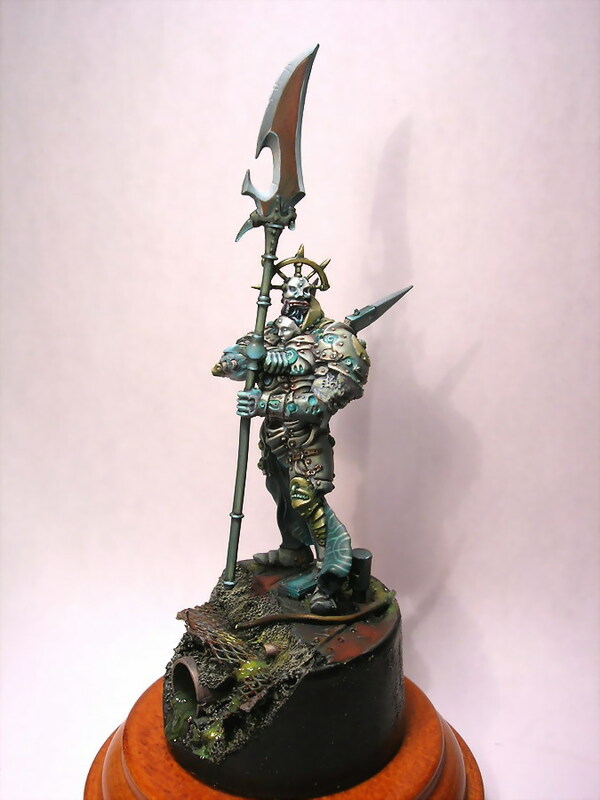 The halberd pole was painted with catachan green + scorched brown + scaly green highlighting with rotting flesh, and the gems were painted with chaos black + fortress grey + hawk turquoise highlighting it slowly with skull white.